Seaver » What does the concept of well-being mean in the horse? What does the concept of well-being mean in the horse? Animal welfare has been arousing scientists and general public’s interest for a few decades. What does this concept really mean and what can we do to improve the well-being of our horse? Well-being is a concept that is difficult to define. For some it comes down to a life in the meadow, for others to a life in stable with a lot of care and finally others will situate it to a ride without constraint. Well-being can be considered as "the state of complete mental and physical health of the animal that results from the satisfaction of his essential physiological and behavioral needs and his ability to adapt to his environment" (ANSES, 2014). Be protected from fear and distress. 2. 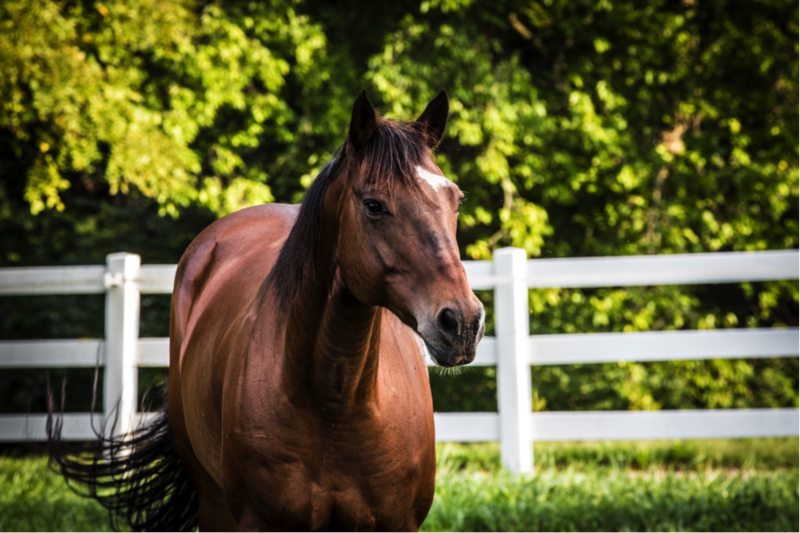 How to evaluate the well-being of horses? Animal welfare is a complex multifactorial state. It is divided into 4 main principles: food, accommodation, health and behavior. Its evaluation requires assessing different criteria using indicators. There are 3 types of indicators: health, behavioral and physiological indicators. Well-being is assessed in a horse at rest but also at work. Fodder should be the main constituent of the ration. The optimal amount to bring in hay is 2% of the live weight (LW) of the horse in kg of dry matter (DM) - about 10kg for a horse of 500kg that is not overweight - to allow consumption distributed over the day, without exceeding 4-6 hours of fasting. 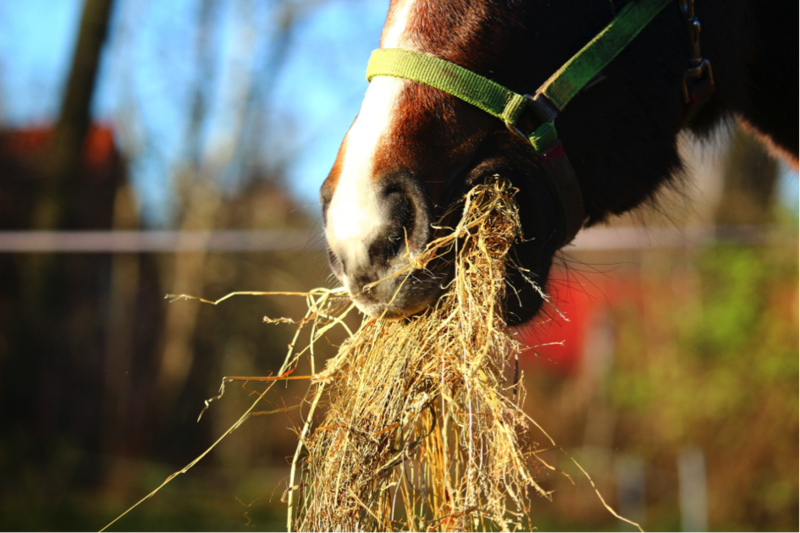 Low daily amounts of hay increase the risk of colic, ulcers and stereotypies. Find here our article on “how to feed a horse well?” and our advice to manage a stable horse. Whatever the distribution system, it is necessary to check that the horse has access to clean water at all times. A horse drinks about 5L of water per 100 kg live weight per day. This consumption can go up to 60 liters per day. The consumption varies according to the temperature, the type of food or the physiological state. Exercises also induce significant losses of water. For example a horse performing intense exercises in hot and humid conditions will lose between 10 and 15 liters of water per hour. How to act on well-being via the food distribution? Ideally, the horses should have as much hay as they want to eat their daily ration in 15 to 16 hours without the amount ingested exceeding their normal ration. For that, it is possible either to multiply the distributions, or to limit the accessibility with hayracks or with nets of hay. For the distribution of concentrates, the ideal is to multiply the meals. Studies have shown that automatic distribution of concentrates reduces the excitement of horses when distributing and thus helps to limit the development of gastric ulcers. If the distribution is manual, care should be taken to do it as quickly as possible so that the last horse served does not have too much time to secrete stomach acid in his empty stomach. Functional wheelbarrows, accessible feeders and well-identified rations contribute to rapid distribution. It is necessary to provide the horse with a clean, dry and secure space for rest whether inside or outside. If he lives inside, the stable must be big enough for the horse to move, roll, and lie down without getting hurt. The litter must be maintained and in sufficient quantity, whatever the type of litter (straw, wood shavings or mattress...). Under no circumstances should the soil be seen and the litter must be dry. Inside and outside, it is important to take into account the thermal comfort zone of the horse (between + 5°C and + 25°C for unclipped horses in temperate regions). If necessary, do not hesitate to provide him with a blanket or a shelter especially in winter. Also do not hesitate to take a look at our article "Choosing the proper blanket". You will find all our tips to help you enjoy winter. It is also necessary to monitor the horse's environment. Humidity should be reasonable and between 40% and 70%, adequate ventilation and sufficient lighting. How to improve the comfort of the horse in the stable? Stables are confined spaces and opportunities to get hurt are abundant. In order to limit injuries, the use of a shock absorbing coating on the wall is appreciable and even essential for the most nervous horses. Lying down is unanimously recognized as a sign of well-being of the horse. The installation of a rubber coating on the floor of the stable insulates it thermally and its flexibility gives it a comfort, which encourages the horse to lie down peacefully. Finally, the behavior of people in stables has a direct impact on the welfare of horses. Calm people who are attentive to the needs of horses are the keystone of a relaxed atmosphere and pleasant stables. It is important to verify that the horse expresses the social behaviors and normal behaviors of the species. The horse must be able to interact with his congeners whether by total, olfactory, visual or auditory contact. He must also trot, gallop freely without being at work with access to a relaxation area: paddock or meadow. 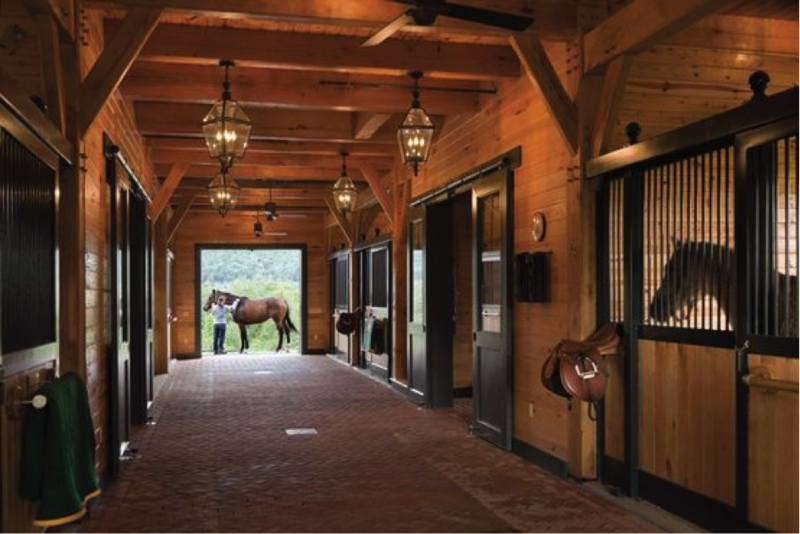 Whether the horse is at work or not, and whatever the type and level of this work, it is recommended to let the horses out on average at least 2h/day, if they are housed in stables. How to facilitate social relations? 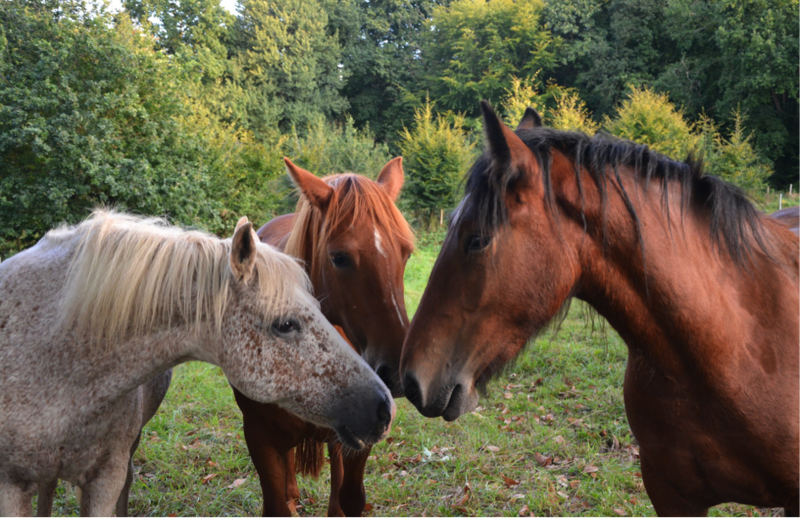 In stables, horses will still look for social relations. Enabling these relationships while maintaining safety contributes to well-being. Unshod horses and ponies can be unleashed in neighboring paddocks at first before being unleashed together regularly so that they have the opportunity to express their social behaviors (mutual scratching, games, etc.). 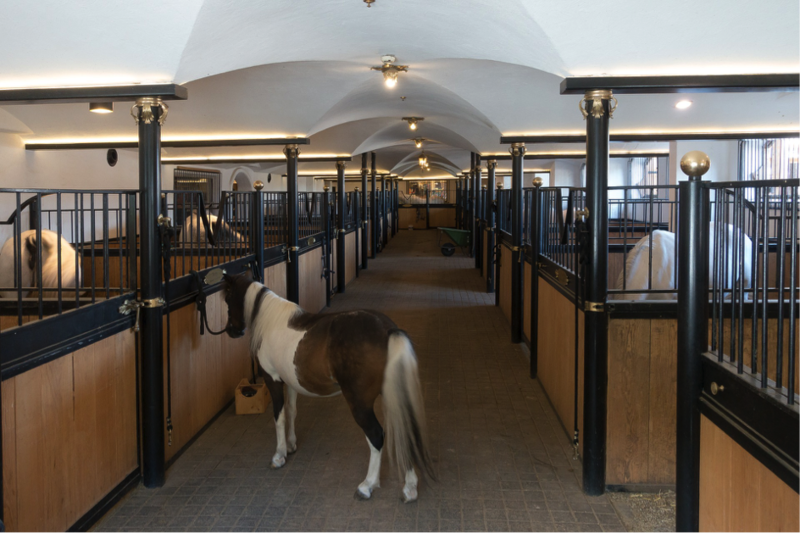 In stables where horses spend a lot of time in stables, installing walls with bars allows horses to feel and see each other and provides a better atmosphere than with blind walls. Do not hesitate to contact your veterinarian if in doubt! In addition to the indicators at rest, there are also indicators for the horse at work. How to monitor the health of your horse at work? Thanks to Seaver and the analysis of the training sessions proposed by the application, including measuring the time spent at each leads, the trot symmetry, the cadence, the elevation or the hindlimbs push symmetry while jumping, you will be able to spot some of these irregularities. The time spent walking for a stable horse is an important data. It is necessary to let your horse warm up before working, at least 10 to 15 minutes of walk are recommended at the beginning of the session and 10 minutes at the end of the session for recovery. It will be necessary to increase these durations in cold weather and according to the pathologies of the horse. It is also possible to detect pain thanks to the cardiac constants; a sudden increase in heart rate during a session and a decrease in heart rate variability can unveil stress or an abnormality such as hoof abscess or lameness. It is also possible thanks to these constants to check the adequacy of the workload with the condition of the horse by focusing on post-effort recovery. Finally, at the end of the training session, remember to check the absence of injuries or swollen areas, especially in the areas of friction of the saddle, bridle, bit, various equipment (boots...). There are several behavioral indicators that will help us to distinguish horse unease at work (indicators can be observed before, during or after the training session). It is important to know your horse well. You have to know how to observe him and be attentive to any change from the usual behavior. How to reduce the horse's unease at work? 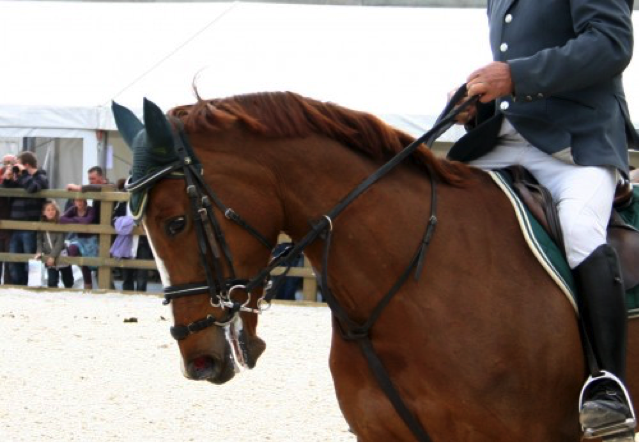 A noseband too tight can have a negative impact on the behavior of the horse at work. 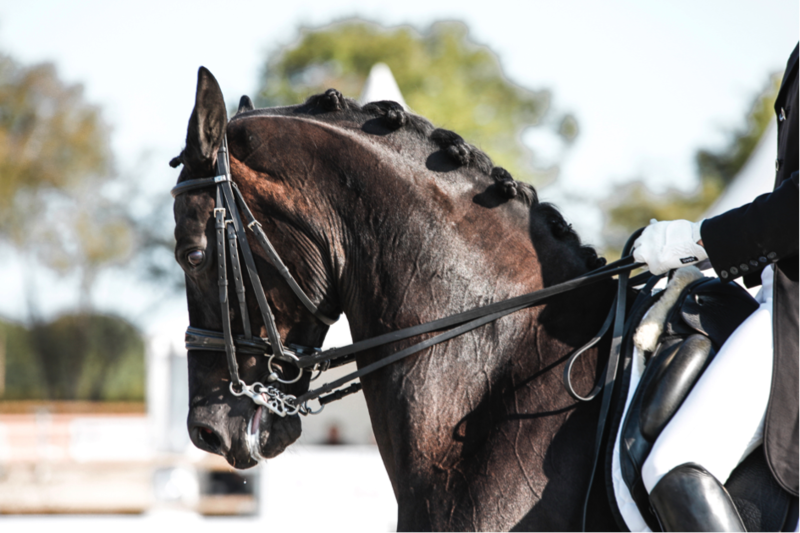 He experiences pain and/or discomfort when there is no free space in the noseband. It is recalled that a noseband normally tightened allows the passaging of two fingers. On a horse that drools abnormally, that does not swallow or that has respiratory problems only at work, it will be necessary to pay attention to the tightening of this noseband and possibly loosen it if necessary. It is recommended to limit the use of spurs on a horse that often switches his tail at work. This kind of manifestation can in some cases be linked to pain. A veterinary examination will be useful to eliminate a painful origin. Finally, for the comfort at work, it is important to have a professional (saddle-fitter for example) check regularly that the equipment used is suitable for the horse.